As we did the last trip, we visited with Lydia Aisenberg at Givat Haviva to understand the peacebuilding work that the kibbutz did. (More about that here.) And we also walked into the town of Barta’a–divided once by the green line in 1949 and again with the security fence a few years ago. Student Lauren Koehler explains the history and impact of the town. The village of Barta’a is divided in two. Straddling the Green Line, there’s Western Barta’a, which is in Israel, and Eastern Barta’a, which is in the West Bank. However, the Israeli security fence that closes off the West Bank is actually located some thirty kilometers west of Barta’a itself. Oh, and basically everyone who lives there is part of one large, extended family. It only gets more complicated from there, and the issues raised by Barta’a are, I think, a lesson on the difficulties that arise in trying to come up with big-picture solutions to problems with many local and personal dimensions. It’s also a lesson in unintended consequences. Barta’a’s problems started with the creation of the Green Line, also known as the 1949 Armistice border. Due to the lack of detail on the maps that were used by the military commanders, the armistice line was drawn right through the middle of the village, leaving half in Israeli control and half in Jordanian control. Overnight, families were separated because of an unclear map and, reportedly, a green crayon. 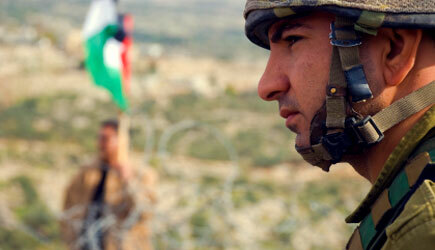 Travel between the two halves of the village was nearly impossible until the 1967 Six-Day War informally reunited them. Today, Barta’a’s problems—and successes—stem in many ways from another decision made at a national level: the positioning of the security fence between Israel and the West Bank. It was placed some thirty kilometers west of Barta’a, leaving Eastern Barta’a as a small enclave of Palestinian territory within the fenced-off Israeli state, separated from the rest of the West Bank by the fence and its security checkpoints. Why this decision was made is something of a mystery; it may have been due to the space requirements of the fence and the tight quarters in the village itself, or it may have been because the government, looking at Barta’a and its nearly-all-related residents, didn’t see Eastern Barta’a as a security threat. Regardless, the decision was made, and the fence went up. This has left Barta’a in a unique position of having a nearly-invisible border running right through the middle of it—a border that can be crossed merely by following the road over a large ditch, with no security whatsoever. But, oddly, it has also left Barta’a in an extremely advantageous economic position. Palestinian businesses relocated to Barta’a, because of the ease of access for their Israeli customers. In turn, these businesses are popular with Israelis because the prices are lower; in part because many of them don’t pay taxes—no one is around to collect. Rents in Eastern Barta’a are extremely high, due to the number of Palestinian businesspeople who either travel to the village regularly, or wish to live there for the business opportunities presented, as well as the number of people who want to work there. During our tour we saw not only the usual shops and artisans expected in a village, but also a new shopping center development under construction, mere steps over the Green Line. In effect, two decisions made by people in authority, at least one with essentially no information about the local consequences of the final determination, led to a bizarre history of anguished separation followed by the emergence of an unintended boom town—the result of the creation of an accidental free-trade zone between the West Bank and Israel. What can we learn from Barta’a? At the very least, that even stupid decisions can have positive consequences. But I think a more important lesson is that consideration should be taken for the local-level consequences of high-level governmental decisions. While the story of Barta’a seems to have landed on a positive note, at least for the moment, it’s easy to see how the story could have ended with a town, really an extended family, torn in half by a green crayon. National and international solutions are all well and good, but if the decison-makers don’t consider the consequences for the actual people living actual lives under the decisions that are made, the “solutions” won’t really solve anything.